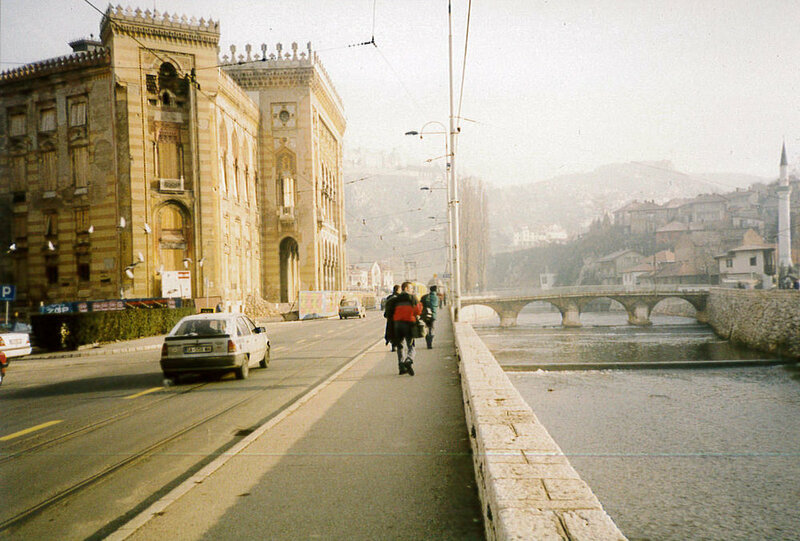 Working for an independent production company in London in my 20s, I had the opportunity to take a small crew to the city of Sarajevo to film with an organisation called Project HOPE. 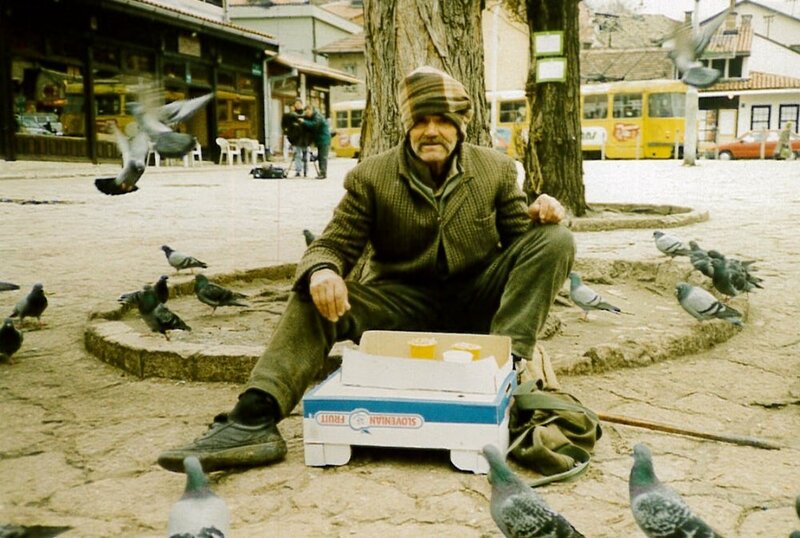 Just a few years after the Bosnian War, it was helping rehabilitate children who had been unable to access key services or had been born with specific needs during the conflict. My first solo trip for the company, I flew to Zagreb and caught an internal flight to Sarajevo to meet the American director plus a cameraman and sound recordist from Ireland. I carried an expensive wide-angle lens in a flight case, and a thick wad of US dollars. My job was to get us to our locations on time, pay for everything and ensure the lens’ safe return. 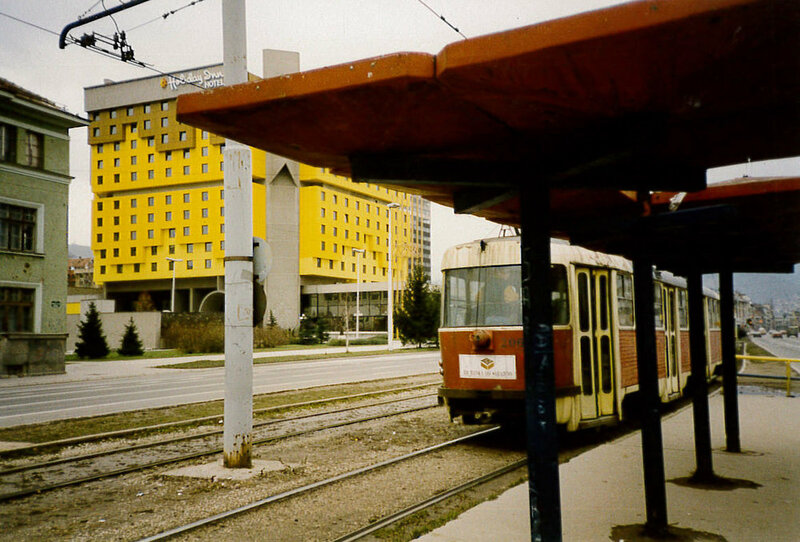 We stayed in the iconic yellow Holiday Inn, once a symbol of the city’s 1984 Winter Olympics, which became a central point on ‘Sniper Alley’ for journalists to file their copy during the 3-year siege. Our fixer, Dado, took us into hospitals, to meet people in their homes, and to various sites around the surrounding area. We visited Markale market, scene of the war’s biggest loss of civilian life, when in 1994 a mortar attack killed 68 people and wounded 144. 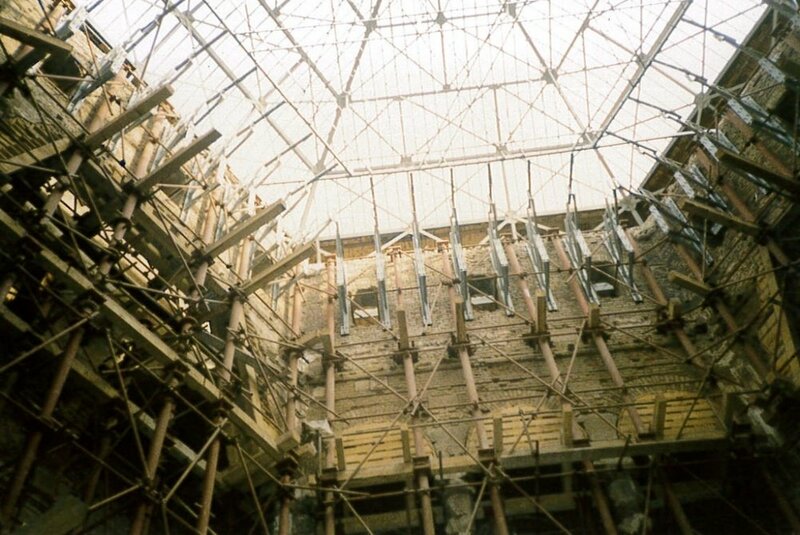 We gazed at the fragile skeleton of the City Hall and Library roof, trussed up with scaffolding, where two million books had gone up in flames following a Serb strike in 1992. We filmed the crumbling Oslobođenje newspaper building, and a once soccer field outside the Olympic stadium complex, transformed into a graveyard for the victims of war. I didn't keep a proper diary of the trip so memories without pictures I can hold in my hands remain mostly impressionistic, only some more vivid. On my internal flight I was seated next to a German passenger. We didn't speak each other's language, but we managed to 'chat'. He was visiting hospitals in the city too, and he opened a large, flat box to reveal a huge tray of glass eyes, smooth glossy orbs, each a different colour. I recall the smile of a little girl waiting for her physiotherapy appointment as I gave her coloured pencils and a London picture postcard, small gifts. One early morning we drove to a high spot above the city to film the sunrise. Standing next to a municipal tap on the side of the road, the cold from the running water was palpable, it seemed to emanate into the chill air. Only afterwards, seeing images of crocodile lines of Sarajevan citizens queueing for water during the conflict, did I understand its significance. A woman sang plaintive folk songs for us in her living room while one man spoke of his tears when he saw lights from the trucks of the U2 convoy rolling into town for a landmark concert in February 1997; a tangible sign that peace had arrived. Dado, our constant companion carried a sense of guarded sadness with him. Or so I felt. But at that age and at that time, I didn’t carry the emotional weight to ask why. On our final night in the city we ventured out to a club to celebrate. We could have been anywhere in the world. The bar was busy, the music loud, and the drinks were large. Early next morning, hungover, I left my hotel room – with the wide-angle lens still in it. Our cab had to take a swift U-turn back to the Holiday Inn to retrieve the flight case. We all made it home in one piece. Twenty years on I compare my own grainy images with those of Alexandre Kurek of #allcitiesarebeautiful. Exhilarating in their scenes of ordinary, everyday life, Alexandre’s photographs make me feel joy, and tenderness. I see a city repaired – though peace these days is such a delicate construct. I still see pigeons by the fountain in the Old Town, and people going about their day. Urban rooftops and traditional Bosnian coffee shops. I see minarets and a marketplace as a memorial, with names of those who died inscribed into its walls. And I know that the library has risen from the ashes, and is reopened, alive and filled with words again. Thank you to Alexandre Kurek and #allcitiesarebeautiful. Find out more about the work of Project HOPE and check out Monocle's September 2017 Arts Review on Sarajevo's art scene or The Independent's recent city guide. Words & Images © Debra O'Sullivan 2018. All Rights Reserved.